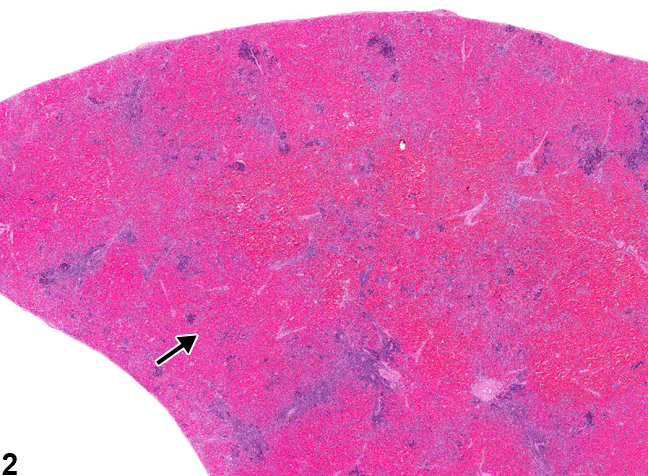 Spleen - Congestion in a female F344/N rat from a chronic study. The red pulp sinusoids are moderately distended by erythrocytes (arrow). Spleen - congestion in a female F344/N rat from a chronic study. The red pulp sinusoids are markedly distended by erythrocytes (arrow). Congestion of the spleen is characterized by excessive distension of sinuses within the red pulp by erythrocytes ( Figure 1 and Figure 2 , arrows). Splenic congestion is common, although a cause is not always apparent. Iatrogenic factors affecting the amount of blood within the splenic sinuses in rats and mice include the manner of death, the method of euthanasia, and necropsy procedures. Other causes of splenic congestion include cardiovascular disease, mononuclear cell leukemia in rats, and erythrocyte damage secondary to treatment. Congestion of the spleen should be distinguished from angiectasis, hemorrhage, hemangioma, and hemangiosarcoma. Angiectatic blood vessels in the spleen can be congested, but "splenic congestion" is typically a more generalized lesion involving the red pulp sinuses. Congestion can be difficult to differentiate from hemorrhage in the spleen; however, it is not typically associated with hematomas or neoplasia (see Spleen - Hemorrhage). 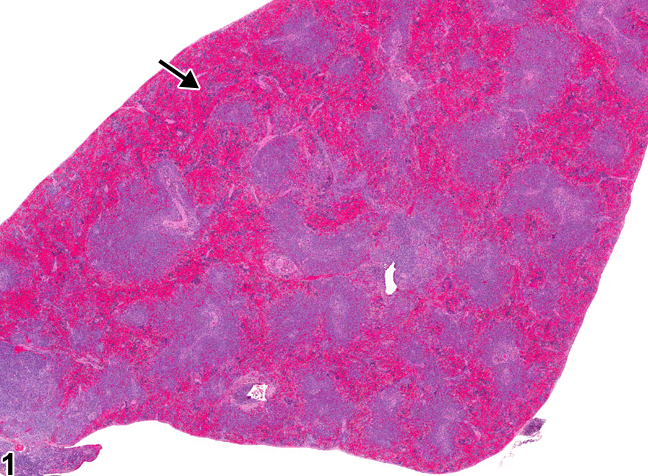 Splenic hemangiomas and hemangiosarcomas are neoplasms derived from the splenic vascular endothelium. Congestion of neoplastic vascular channels may occur with splenic hemangiomas and hemangiosarcomas; however, the diagnosis "Spleen - Congestion" should be reserved for congestion of the red pulp sinuses. Whenever congestion in the spleen is believed to be associated with treatment or with a gross lesion, it should be diagnosed and assigned a severity grade.